Learning how to do laundry is not difficult. Today’s fabrics, detergents, and machines take most of the mystery and mistakes out of the process. Follow these 10 basic steps for washable clothes and you'll have clean laundry to wear and use tomorrow. Before you get started, however, determine if your clothes really need to be washed. You'll save time and money if you follow these laundry hacks to stay on top of laundry and guidelines for cleaning men's and women's clothes. Place all clothes that are labeled “wash separately” or “hand wash” into separate piles. If the label says, “dry clean only,” believe it and place it in a bag to take to the dry cleaner. There's no need to risk damaging any special fabrics by trying to save time or money and tossing them in the washer. In the future, try to avoid buying delicate items if you prefer not to deal with special laundry care. Whites, pastels, light grays, and white background prints will go in one pile. Deep colored clothes—black, red, navy, brown, dark gray—go in another pile. Heavily soiled clothes should be washed separately. Sort each pile one more time by type of fabric. For instance, in the whites pile, separate towels, and sheets from apparel. In the dark colors, separate t-shirts and jeans from lighter weight items like blouses and dress shirts. Washing by fabric type allows you to use different water temperatures and keeps drying cycles simple. To reduce lint, never wash lint producing fabrics and lint attracting fabrics together! If there are not enough items for a full washer load of each type of fabric and you are in a hurry, you can wash all items of each color together. Just be sure to choose the washer cycle to fit the most delicate garments in the load. Select an all-purpose laundry detergent. Read the directions to determine how much to use based on the size of the load. If your clothes have stains, pre-treat them before washing so it doesn't set in. Simply apply a stain remover or rub in a bit of laundry detergent. Add the detergent to the washer drum or dispenser before loading it. This will prevent residue on your clothing. Unless your clothing is caked with dirt and heavily stained, washing in cold water will serve your needs and prevent most laundry disasters. The exception is cotton underwear and bed sheets that need hot water to remove body oil. Bed linens and towels need to be washed at the highest recommended temperature at least every other wash to sanitize them. No matter the temperature, always rinse in cold water. You will also want to choose the best washer cycle for the fabrics in the load. The "normal" cycle will be fine for most loads, but you may also need to use "permanent press" or "delicate" for certain fabrics. "Heavy duty" is great for articles like jeans and towels. Take a bit of time to double check everything before you load the washer. This will save you from any last-minute mistakes. Look for any stains and pretreat them. Certain types of stains require special techniques to remove them, while many can be handled with a spot treatment. There's also a proper approach for mystery stains when you're not sure what caused it. Also, check that all pockets are empty—no tissues or paper, either—to prevent disasters. Remove any accessories such as belts and jewelry. Close all zippers and buttons to prevent them from catching the fabrics. Load items into the washer one at a time, making sure they are not in a wad. Do not cram the washer too full. The clothes need room to move about in the water. To protect fabric finishes and reduce the “washed out” look, turn knitted items, corduroy, textured fabric, and dark colors inside out. Promptly remove wet laundry from the washer to lessen wrinkles and prevent mildew. Hang items to air dry, lay flat to dry, or place them in the dryer. If you did not separate loads by fabric type when washing, do it now before placing items in the dryer. It's important to dry all lightweight items together and all heavy fabric items together and choose the correct dryer temperature for each. This will help prevent shrinking and protect your clothing. There are many good reasons why you might consider hang drying your laundry. Chief among those are saving energy (and money) and less damage to your clothes. Not everyone can do this, though, because of space and weather restrictions. If you are able, be sure to get a few tips for hanging clothes on the line. As soon as your clothes are done drying, you'll want to take care of them right away. Hang or fold each piece as it comes out of the dryer to prevent wrinkling. And, of course, iron if you must. Mistakes happen. Everyone makes them but here's some help to save the day...or your favorite shirt. Laundry is much less overwhelming if you do it frequently. If you let a mountain of dirty laundry accumulate, it can become scary. 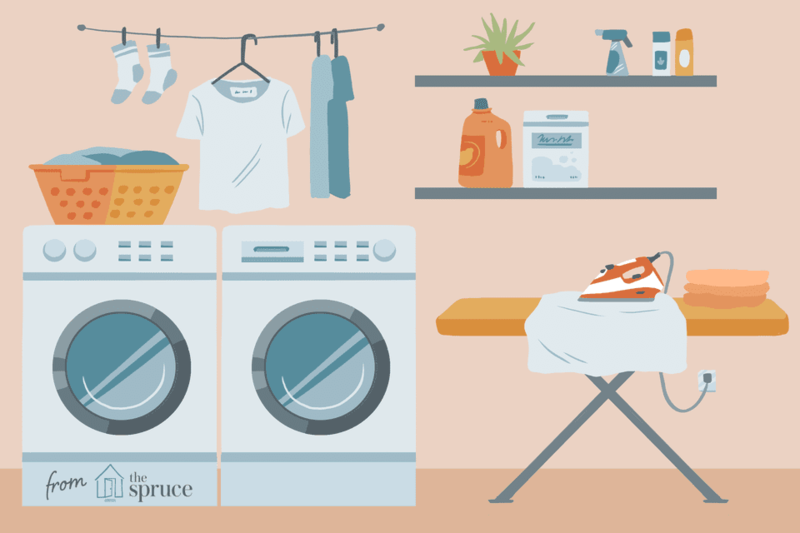 Even if it is a hassle to go to the laundry room or laundromat, try to use the time to read or relax and enjoy the scent of your fresh laundry.